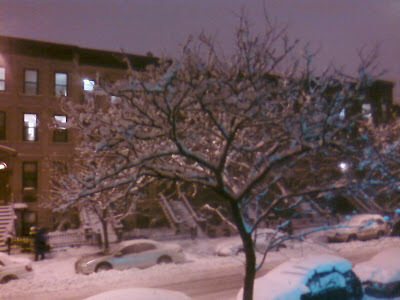 Lovely weather this morning--now THIS is what I call a snowstorm! 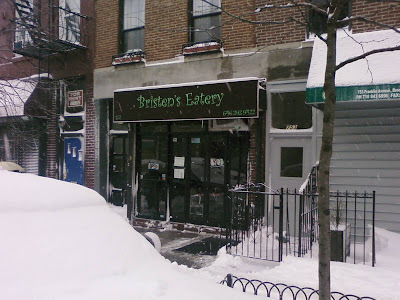 Bristen's new sign looks good, too, snow or no. Our opening weekend will begin with a fundraising screening on Saturday February 27th from 7:00PM to 9:00PM of "Taboo Yardies" (trailer here), a provocative film by Jamaican filmmaker Selena Blake, that delves into the controversial world of homosexuality in Jamaican culture. This event will feature a silent auction and Q&A with Selena Blake. On Sunday from 5:00PM to 9:00PM we will introduce Haitian artist Baruti Tucker's "Soulah Sista" - a vibrant series of works celebrating the female form in honor of Women's History Month. A portion of sales from this event will benefit earthquake relief efforts in Haiti. 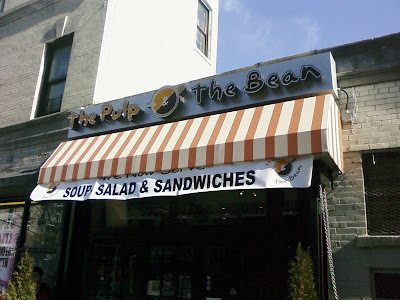 The address, as you might have guessed, is 1158 Dean (between Bedford and Nostrand). Admission is $20 to the Taboo Yardies screeening, and the Baruti Tucker opening is free. Just in case you haven't heard . . . Pencil Party! One of the perks of keeping a local blog is getting the occasional tip about an upcoming event. 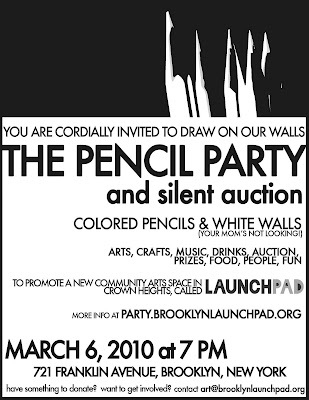 Usually I'll get an email from the organizer, or maybe read about it on Brooklynian's message board, but in the case of the upcoming Pencil Party at LaunchPad on March 6th, I've been hearing about it absolutely everywhere. 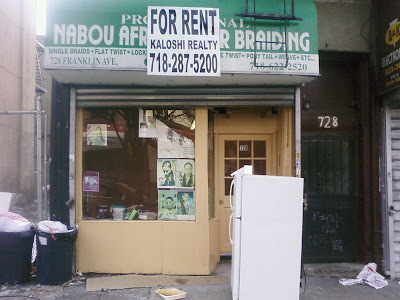 It's on Facebook, Nostrand Park, and Brooklynian, and I've received no fewer than 4 emails about it this week, from organizers, neighbors, and community groups, including Masai Marketing (who organized "Experience the Heights" a few weeks back). In short, this party is not to missed. 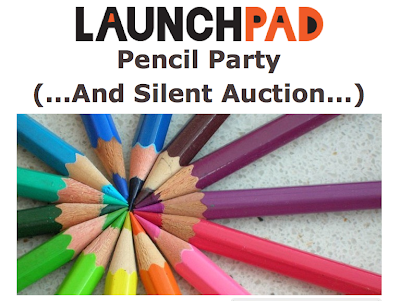 In case you haven't heard about them, LaunchPad is a new community arts space opening up on Franklin Avenue, and they're using Kickstarter to raise 6,000 bucks by March 8th. Check them out online, and mark your calendars for March 6th (details in the flyer above)! I'm a big fan of murals, so I stopped and grabbed a shot of this one on the wall of a day care center at Hegeman and Osborn. 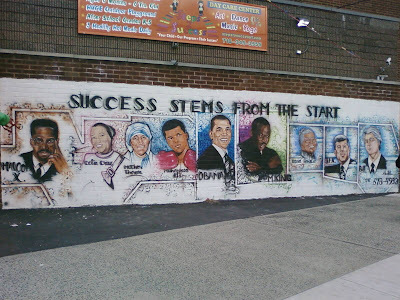 Titled "Success Stems from the Start," it features the usual display of presidents, civil rights leaders, and other heroes, and it's one of the best I've seen (click on the photo for a larger view). I particularly like the MLK in the middle--public images of him are usually so bland. There is one twist: look at Bill Clinton over there on the far right! Has he ever made this face in public? (Apparently, yes). Barack and JFK look smiley and presidential, but bad bad Bill is hanging out in the corner posing for the paparazzi, or at very least daring you to vandalize the mural. Two people who I showed this image to before posting it didn't find it all that funny, but I do, so up it goes. I get a kick out of what it says about our historical memory of the Clinton years, and the Clinton of those years, as well as how it sits slightly off-kilter to his current public persona. 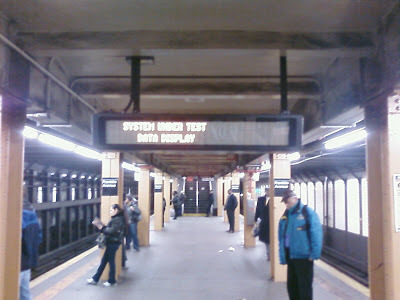 I blogged about the digital display testing on the 2-3-4-5 platforms awhile back, and it seems the MTA is going ahead with plans to implement the use of the displays for train arrival information in all numbered-line (IRT) stations by the end of the year. In order to cut costs and make the system work for lettered-line trains, however, the MTA is trying to use existing technology instead of installing the new gear you see on the L (and now on the 6 line in Bronx). The only drawback? The system doesn't know which trains are coming, just that something is moving down the line. As long as they can differentiate between express and local trains (and the signs in the press release suggest that they can), I think that's fine. If not, well, the only thing more annoying that standing for 20 minutes at the Franklin C stop as three A trains go whizzing by would be listening to an announcer's voice tell you that your train was about to arrive over and over. 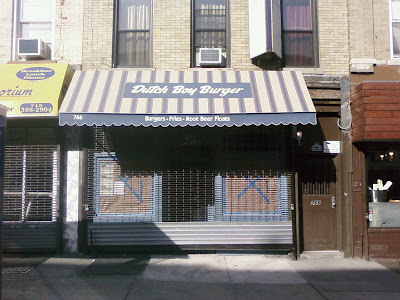 (Updated 2/22): The awning is up at Dutch Boy Burger, the soon-to-open burger joint from Franklin Park's owners. The retro-looking signage advertises "Burgers, Fries, Root Beer Floats." (I hope they'll let me bring a scoop of ice cream down the hall to the bar for a Guinness Float, too). Meanwhile, down the avenue, 728 Franklin, formerly Nabou African Hair Braiding, is getting a fresh coat of peachy-colored paint inside and out, and the inside seems to have undergone some renovations. The painters didn't know what the new business will be, but the interior walls and partitions seem to suggest a small office or take-out place. If you've got any information, post it here. A block beyond, the makeover at Yafaa Money Market seems to be nearing completion. While I'm at it, a project that's not as far along but will hopefully one day be putting paint on walls, the Lefferts Farm Food Cooperative, has another meeting this Tuesday, February 23rd, at the Maple Street School in PLG. And now, it's time for the ultimate act of self-reference in the self-referential world of blogging: the comment review! Ego-stroking aside, 2010 has been a very fruitful year of keyboard-tapping for I Love Franklin Ave: readership is up, and comments are on the rise as well. I'm always psyched that people read the blog, but when soliloquy turns into dialogue, it's a special thrill. So, without further ado, here's a round-up of some of my favorite responses, many from individuals who would be far more qualified to write a Franklin Avenue blog than yours truly. - A whopping 14 people jumped in to comment on a terse, awkward posting about a drug bust and the minefield of racial and class tensions simmering in the gathered crowd. Some posters were glad that "the police are taking drug activity seriously" while others worried that "law abiding "old timers" could not tolerate this behavior also . . . so why does it only seem that NOW Police action is being taken on a serious level?" Nostrand Park offered their take as well. - An recap of a neighborhood clean-up on MLK day drew the eloquent ire of anonymous local, who argued that "it might be more appropriate in memory of MLK to examine how the rapid change in prospect heights has effected our Black / African American neighbors, and to find a way to serve their struggle with racial and economic justice," and noted that "Police aggression is common when you aren't white, and you should not take it as evidence that someone has done something wrong." This critique (it got a little nastier) drew a reponse from the event organizer, who simply said "This clean up was to show some respect for our home, our neighborhood, and you, our neighbors." - My long-winded reply to both controversies comments from two longtime locals. Mitch , whose father opened Maiman's Pharmacy when Crown Heights was still a Jewish-Italian nabe, observed that "Brooklyn neighborhoods, especially Crown Heights, have been in a constant state of transition. In reality, nobody can claim permanent ownership of the neighborhood," and urged residents to embrace change, "no matter how unsettling." Offering a counterpoint, Roni said "I'm not concerned about different ethnicities moving in" but that "Change is unsettling when your elderly family members are forced to move into shelters" because they can't afford rising rents and cost of living. At this meeting Commissioner Hess said that plans to turn the Armory into the major processing unit for men entering the shelter system had been permanently scrapped. 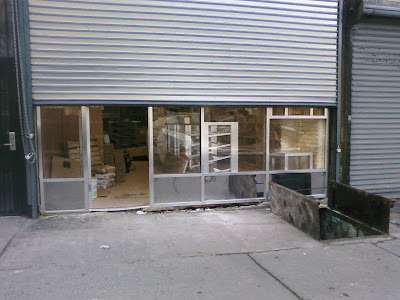 The major entry processing center will remain in Manhattan. However, since over 30% of shelter residents come from Brooklyn the Armory is planned to serve as a much smaller, secondary processing center to serve the homeless of Brookyn. Nostrand Park jumped in with their own thoughts and poll of local residents. 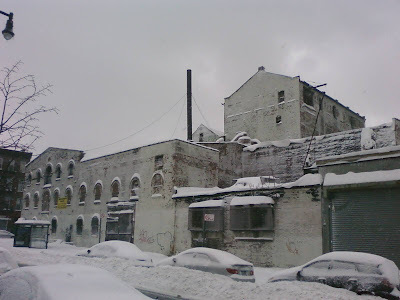 - Notes on the upcoming demolition of NYCHA's Prospect Plaza brought thoughtful insights from local commentor-in-chief nat and author Roberta Brandes Gratz, who has served on several mayoral planning committees. Thanks to everyone who offered their take in the past month, and please, keep the comments coming! I'll hopefully add photographic evidence of this tonight or tomorrow, but it appears that the Church of St. Joseph on Pacific Street between Underhill and Vanderbilt is losing its towers as part of the extensive renovation and restoration the church is undergoing. The towers, which looked to be in a state of fairly severe disrepair before the scaffolding went up, are about halfway to being disassembled as of this morning, when I spied them on a run. While I couldn't find more information about the renovation online or by calling the parish, the chatter on the comment thread at this site suggests that the building is being overhauled for a return to service as a parish church, and possibly as the new Cathedral of Brooklyn. 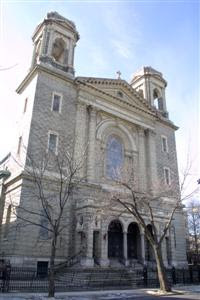 The current cathedral (and also the borough's first Catholic Church), the Cathedral Basilica of St. James at Jay and Chapel Streets, is both on the smaller side and a long haul for many of the borough's Catholics, and as a result, many of the biggest services are now held in Sunset Park at the Basilica of Our Lady of Perpetual Help. Moving the cathedral has been suggested before--Brooklyn's legendary Bishop Loughlin began work on one that becamse the parish church of St. John in Bed-Stuy--but why St. Joseph's, built in 1912 on the site of an earlier church organized in 1861, would earn the honor isn't clear. The fight over preserving churches with dwindling congregations and fading physical plants is a thorny one. Yesterday, the Observer ran an article about the battle over the landmarking of a red-sandstone Presbyterian church on the UWS (the church was opposed to the move), and earlier today, Brownstoner posted a Brooklyn Eagle article about the fight to preserve Our Lady of Loreto in Ocean Hill. Preservationists make a strong case about the beauty of these buildings and their enduring architectural contribution to New York City's streetscapes. At the same time, they're expensive to maintain, difficult to sell in their current form, and even more difficult and expensive to repurpose. A few have become condos (which was the original plan on the UWS) and a few others have been sold to new congregations, but condos aren't rising right now and new churches can find cheaper, less-development-restricted spaces in old movie houses and union halls and the like. Without strong support form parishoners, church leaders say that preserving these elegant, empty halls isn't a good use of their funds--a building's beauty doesn't give sermons or provide services. In a perfect world, the neighborhood groups that want these structures landmarked would also have great ideas for filling the spaces and managing the buildings. Sadly, they can't do this at the rate these buildings are closing, and the empty churches (and movie palaces, and union halls) that litter our urban landscapes may be evidence of a larger societal move away from the communal experience, be it the church dinner or the matinee, and into our own homes, where entertainment, local politics, and even worship can be conducted from a couch with a remote or a laptop. A documentary team from the Smithsonian's Native Networks set up shop in The Pulp & The Bean on Monday to tape an interview with Tiokasin Ghosthorse, the Lakota musician-storyteller-activist who hosts First Voices Indigenous Radio on WBAI at 10AM every Thursday. Look for his and other voices in an upcoming documentary. 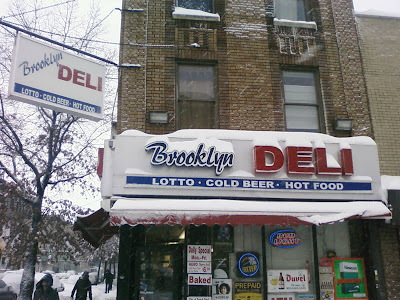 It's easy to forget the history of the original residents of Brooklyn amidst 400+ years of densely-packed urban buildup, but like the rest of the Western Hemisphere, Brooklyn was originally inhabited by indigenous peoples including the Lenape (also know as the Canarsie) and the Rockaway. More recently, New York City has hosted significant populations of indigenous people from all over the Americas, including the Taino of the Caribbean and, perhaps most famously, the Mohawk ironworkers who built New York's high rises and turned ten square blocks of Gowanas/Boerum Hill/South Brooklyn into "Little Caughnawaga." JUST IN TIME FOR THE MIDWINTER BREAK!! WHAT: Black History Month Family Fun Day! Nairobi's Knapsack Toy and Play Gallery is celebrating the great contributions of African Americans throughout history during an afternoon of drop-in play. Just in time for NYC schools' Midwinter Break, you and your children will have an opportunity to learn, laugh and create. Stop by for some inspirational fun, historical arts & crafts, and dramatic storytelling. Light snacks will also be provided. Event is included with drop-in play admission: $5 per child, $3 per sibling, $10 per family of three or more. Please RSVP to info@nairobisknapsack.com with parent name and child(ren)'s age(s). 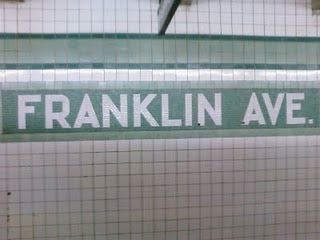 **Take 2,3,4,5 to Franklin Avenue; store is three blocks down. WHO: Created to inspire and cultivate learning, Nairobi's Knapsack Toy and Play Gallery is the quintessential toy boutique, combining carefully selected books and toys with a multitude of children's novelties that reflect our culturally diverse world. In addition to being a premiere children's toy store, Nairobi's Knapsack incites creativity with our spacious play gallery for parents or caregivers who want to use the space for free play, birthday parties or other events. For more information, please check out the website at www.nairobisknapsack.com. Despite some good news about the economy in recent weeks, the Daily News reported on Thursday that the number of New Yorkers losing their homes spiked in January, with Brooklynites "bearing much of the pain." Of 1,825 homeowners who received some form of eviction notice in January, 693 (or 38%) were residents of the borough of Kings. As has been typical of the housing crisis in New York and other major cities, some of the hardest-hit neighborhoods were low to middle-income communities, including Bed-Stuy, East Flatbush, and East New York. While the city as a whole lags behind the national average (one in 409 homeowners faces foreclosure in the USA), these communities, like their counterparts in Queens, have seen the gains of the recent past rolled back in a hurry as jobs, credit, and home security disappear in lockstep. At the height of the crisis, it was easier to find sympathetic ears, but the dominant discourse today is about the improving economy, not those who are still hurting almost eighteen months on. 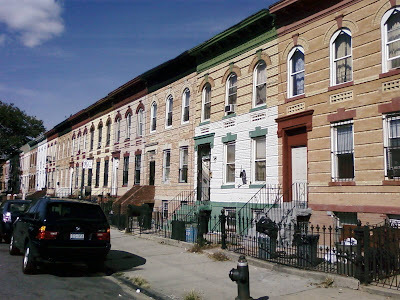 Local groups like the Pratt Area Community Council and South Brooklyn Legal Services continue to provide homeowners with assistance, but despite the well-documented tactics of predatory lenders, the "blame the borrowers" argument persists. The bottom line, this argument claims, is that homeowners should have known better. In defense of the 693 Brooklynites who joined the nightmare ranks of those facing foreclosure this month (and all their counterparts already suffering), I offer the latest big real estate news from Northwest Brooklyn (Manhattan): Tishman Speyer has handed the keys to Stuy-Town over to the banks who financed the $6.3 billion debacle after defaulting on the mortgage. These were not optimistic homeowners seeking a piece of the American Dream--these were, in theory and the estimation of their peers, the finest minds in finance and real estate, from Tishman to BlackRock to Merrill Lynch. In an interesting piece detailing the sale before the default, the Observer likens the rhetoric in the lead-up to the sale to vintage Bush-Cheney-Rumsfeld chatter about Iraqi WMDs. If nothing else, it illustrates the point that even the savviest dealmakers in New York City came up clueless, which adds some perspective to any critique of a Brooklyn homeowner. 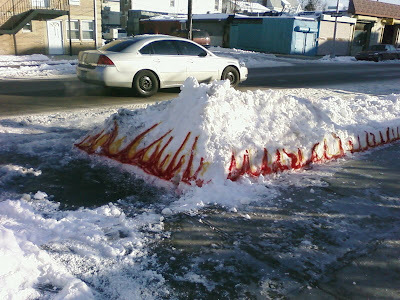 The Snow is ON FIRE! 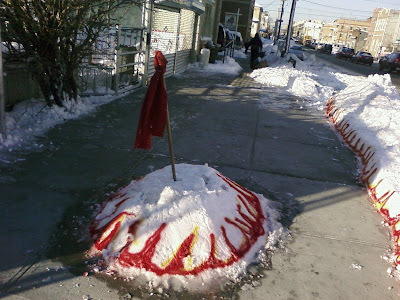 I don't know who was responsible for these painted flames on the snowbanks outside a vacant lot in East New York, but they brightened my morning. So my earlier proclamation is looking more and more foolish as the snow piles up outside my door, but I still claim that, in the grand scheme of things, this is only a mildly impressive snowstorm. 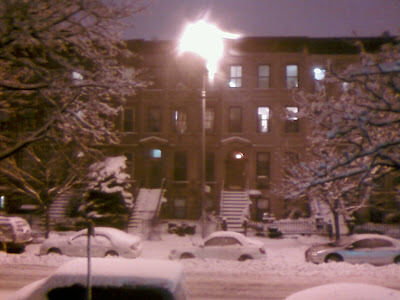 Still, it produced some lovely pictures on my walk home, and inspired the Brooklyn Historical Society to post some even better photos of Brooklyn all a-glitter in the wake of snowstorms past. Snow (but not really that much of it)! 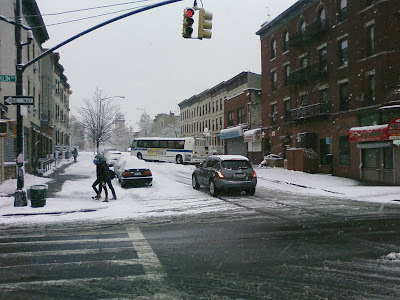 Hailing, as I do, from points north of New York City, I thought today's snowstorm, with two inches of accumulation and a few swirling flakes, was pretty weak sauce, but it proved enough to strand a city bus just below the crest of the hill on Sterling west of Franklin. I suppose it's still snowing--maybe our blizzard is just a late bloomer. Bloomberg stressed the danger posed by heavy snow accumulation in a press conference yesterday, and of course, city schools were closed and hundreds of flights were cancelled. 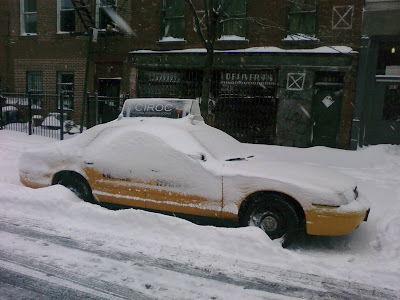 Fair enough--better safe than sorry, and who doesn't love a snowday--though part of me wonders whether New Yorkers and their mayor weren't just getting jealous of DC's snowpocalypse. 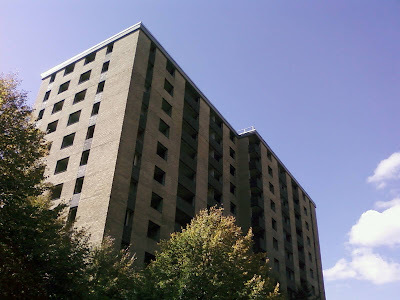 The biggest Crown Heights news last week came from the New York City Housing Authority, which announced the demolition of the 3-tower Prospect Plaza public housing complex. NYCHA claims the cost of renovating the 475-unit complex, at nearly $400,000 a unit, doesn't justify the returns, and plans instead to replace the towers with mixed-income housing. However, former residents, many of whom were relocated within the NYCHA system, have cried foul, arguing that the city's promise to renovate their apartments has been broken and expressing concern that mixed-income development will take longer to build and contain fewer units for low-income New Yorkers. The New York Times ran a good piece on the issues facing both the agency and residents, noting a startling fact. 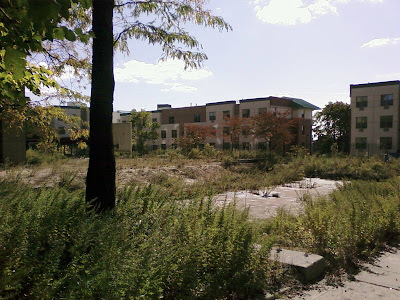 While other cities have leveled their high-rise housing projects with what could best be described as gleeful abandon--Chicago has taken down 79 buildings--NYCHA, to date, has demolished only one: the fourth Prospect Plaza tower, in 2005. The building was replaced with a mixed-income, mixed-use development from MAP, which noted that their design "
will help to set a precedent for future developments in this area." One reason typically given for NYCHA's thus-far conspicuous eschewing of the dynamite plunger is sheer size and density: most American cities, cleared by white flight and suburbanization while the projects went up, have the room to absorb the residents displaced by demolition, but New York City's already-tight residential market couldn't find homes for a significant portion of NYCHA residents if they were turned out. Others make a cultural case--all New Yorkers live vertically, so projects lack some of the alienation and stigma they carry elsewhere--or a management one--NYCHA took much better care of its towers than Chicago or St. Louis. Still, one wonders whether NYCHA isn't starting to envision a grand, post-Robert-Moses remaking of its own, one that looks more like the buildings in the foreground of the bottom photo (above) than the ones looming large behind it. High-rise housing projects were already coming under heavy fire when Prospect Plaza was completed in 1974--residents resented the shoddy construction and anonymous nature of the places, while theorists from Jane Jacobs to Oscar Newman blasted the flawed logic of "towers in a garden." Anti-tower sentiment has only consolidated and escalated since--the NYTimes notes that Baltimore threw a parade when it took town 6 towers in 1995, and Mayor Daley has all but danced on the rubble of Chicago's projects. 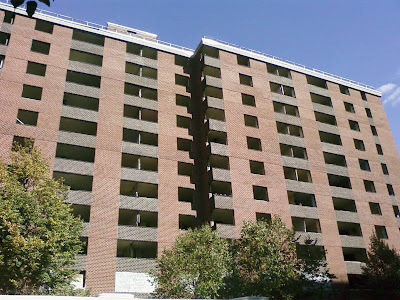 However, the "towers are terrible" and the widespread demolition it has fostered ignore some of the more nuanced realities of public housing and urban development. Two things, in particular, are problematic: first, current residents may have criticisms, but the towers are still their homes, and being evicted anywhere is traumatic; secondly, the widely-hailed solution, mixed-use, mixed-income development, hasn't entirely delivered, for a number of reasons. It takes time to replace projects, and in the interim, residents are at the mercy of voucher programs, many of which have strict requirements if residents want to maintain their "right of return" to public housing, including not leaving the state or living in non-voucher housing (e.g. with relatives). Even for those who do return to mixed developments, the sense of community is often lost and replaced with class contention, and retail prices are often higher. This Chicago Public Radio transcript captures a few of these issues well. Finally, critics say, the demolition of public housing may have less to do with its effectiveness (hate them though you will, towers house people, and despite "defensible space" arguments, it appears they can be managed) than what it represents--poverty--and how this affects other development in the areas near projects. Cynics everywhere have called demolitions land grabs, and cities have, in more than a few cases, proved them right, replacing low-income housing with swank condo devlopments that give lip service to "mixed-income" by providing a few heavily-policed units. Milton Bolton, the president of the Prospect Plaza Tenants Association, has made just such an accusation, pointing out that the Prospect Plaza site could house "another Atlantic Yards." This question of perception is important in Brooklyn's gentrifying neighborhoods, many of which, including Crown Heights, contain significant public housing developments. Do we (the city and the public that our government nominally represents) want to replace projects to improve the lives of those who live within their walls, or do we want to erase these symbols of poverty so that we can better re-imagine the areas around and within them for ourselves? Alright, clear you schedule, because I Love Franklin Ave has your weekend all laid out. 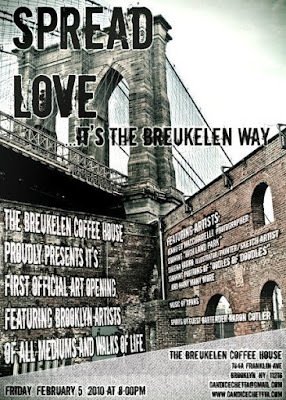 FRIDAY NIGHT - Swing by the Breukelen Coffee House between 8pm -12 midnight for Spread Love, It's the Brooklyn (Breukelen) Way, their first-ever art opening, featuring (and curated by) local artists. Watch this if you're not getting the reference. SATURDAY (DAY AND NIGHT) - Experience the Heights! Swing by local businesses and mention "Experience the Heights" for a 20% discount from 2-4pm (there's a list of participants at the above link) and then hit up Five Myles from 4-9pm for music, art, food & wine. It's a First Saturday, too, and the Heart of Brooklyn Shuttle will be running, so you can't use the snow as an excuse to stay in. 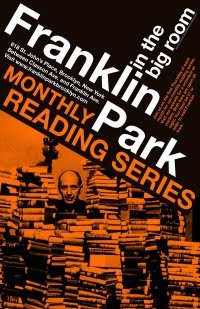 I'll give you Sunday to recuperate, but Monday night it's on again as the Franklin Park Reading Series returns with "Desperate New Yorker Night." With $1.35 in my checking account as of this evening, I can relate, and no doubt you can too, so come by Franklin Park at 8pm for some fascinating stories of the myriad ways this overgrown metropolis can alter the human psyche. JOHN WRAY is the author of three critically acclaimed novels: Lowboy, The Right Hand of Sleep and Canaan’s Tongue. He was named one of Granta magazine’s Best of Young American Novelists in 2007. The recipient of a Whiting Award, he lives in Brooklyn. MELISSA FEBOS is the author of the debut memoir Whip Smart, which will be published by St. Martin's Press in March. She is also co-curator and host of the Mixer Reading and Music Series. She received an MFA from Sarah Lawrence College and teaches at SUNY Purchase College and The Gotham Writers’ Workshop. - The Daily News reports that Borough President (and Crown Heights-born) Marty Markowitz plans to promise $1 million from his capital budget in a speech tonight to convert the notorious Bedford-Atlantic Armory into a neighborhood rec center modeled on the recently-opened Park Slope Armory (Markowitz also wants to target the Sumner Armory in Bed-Stuy). Councilwoman Tish James, who has been a vocal supporter of such a plan for some time now, has said she can raise another $10 million from local, city, state, and federal funds for the project, which the Department of Homeless Services estimates would cost $20 million in total. Even if the rec center project goes through, the city is still planning to open an intake center in the Armory, a project that Crown Heights Revitalization Movement founder Sandy Taggart has said "cannot co-exist" with a rec center. What do you think? The city, if it goes through with the plan, is doubtless hoping a rec center would sweeten the deal and get local residents to drop their opposition to the intake center, but would it be worth it? 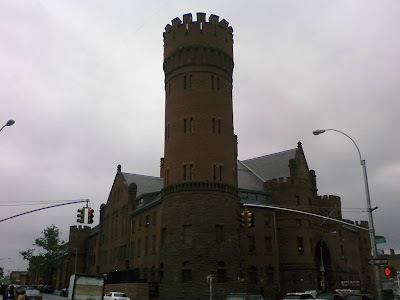 Update: I spent an evening thinking about this, and while the successful Armory Track and Field Center and the Park Slope Armory share their buildings with shelters, the Bedford-Atlantic Armory is a different beast. As the comment below notes, people steer clear of the Armory now with good reason, and the intake project plan would only increase the numbers of people going to and from the site. I would love to have an a great recreation center with all the amenities Markowitz describes (workout gyms, indoor track, art galleries, etc), but for expensive projects like this to succeed, they have to draw significant numbers, and I don't see that happening right now. Would parents send their kids to the Armory? 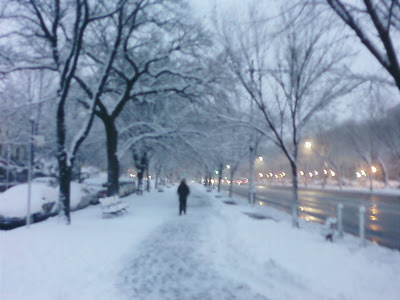 Would single women work out there during the evening if it meant walking home alone? Unless the city really committed to making neighborhood residents feel safe and secure in the presence of increase inflow (something the Bloomberg administration has failed to do so far), I could see a pristine rec center sitting underused and idle while a busy intake center operates below. 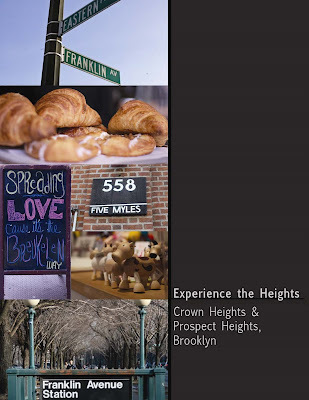 - The Crow Hill Community Association is teaming up with local high school students to create the Crown Heights Oral History Project, who are devleoping a blog as part of their project. Check it out. - There are some wackos in Crown Heights. Surprise, surprise. The digital displays in the Franklin Avenue 2-3-4-5 station were "under test" last week and over the weekend, leading this blogger and a few companions to speculate: Are the long-promised digital train-information displays that, until recently, could only be found on the L Train (which the MTA uses as a guinea pig on account of its stand-alone nature), making their debut on Franklin? Timing trains in a busy, express-and-local stop that serves four lines is certainly a challenge, but as the Post reported before Xmas, the MTA is determined, despite budget cuts, to make good on its promise to roll the technology out in all 152 stations by the end of 2011. Of course, the problem with the trains at Franklin is not so much that they don't arrive, but that they arrive bursting at the seams. Unfortunately, the solution to east side congestion (the much touted 2nd Avenue Subway) is a little further off.